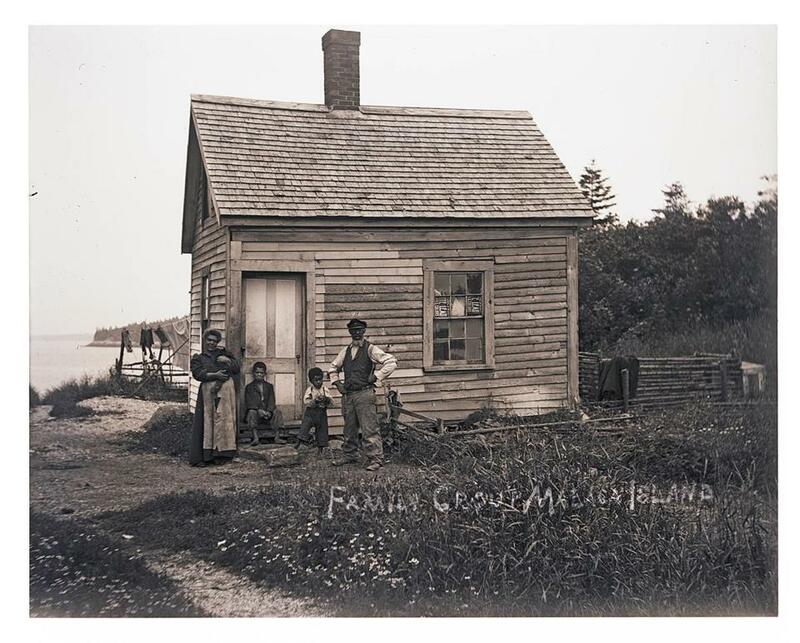 An image of a family on Malaga Island in Maine. The 40 acres of Malaga Island rises out of the water at the mouth of the New Meadows River in Maine. Pine trees, seaweed, silence. No one lives there. But they used to. In the late 19th century through the early 20th, a group of people of mixed races inhabited the place, fishing, catching lobsters. Eugenics was winning converts in the universities and grand parlors, and prejudiced mainland Mainers feared miscegenation. So in 1912, the population of nearly four dozen was evicted by the state, some of them unfairly sent to the Maine School for the Feeble Minded. In her austere and breathtaking new poetry collection, “Midden” (Fordham University), Julia Bouwsma, who won the 2018 Maine Literary Award for her collection “Work by Bloodlight,’’ explores this place, its history. Bouwsma, who lives off the grid in the mountains of Western Maine, conjures the landscape with precision — the blackberries, mudflats, brambles, the fish hooks, the frost-heaves shifting corner posts, a frozen beaver in the barn. The whole haunted, haunting collection reveals the hidden histories, lets us talk with the ghosts. She writes of “an animal scenting storm/under the door crack, sniffing for God,” and there’s a fog-chilled sense in the line “I know soon we will be gone.” Bouwsma will read and discuss the book on Oct. 4 at 5:30 pm at the Chace Community Forum in Waterville, Maine. In 2009, Anita Sarkeesian started Feminist Frequency by uploading short videos that examined pop culture from a feminist point-of-view. She’s best known for the series “Tropes vs. Women in Video Games,’’ which launched the #gamergate hashtag. Feminist Frequency has since grown to an educational nonprofit that looks at how women are represented in pop culture, and Sarkeesian recently teamed with author and activist Ebony Adams to write “History vs. Women: The Defiant Lives That They Don’t Want You to Know” (Feiwel & Friends). The book looks at 25 strong, defiant women throughout history who worked to change the world, including the 11th century Japanese writer Murasaki Shikibu, credited with creating the first novel, as well as a potent gang of artists, politicians, criminals, murderers, and leaders. Sarkeesian and Adams will discuss the book with Jaclyn Friedman on Oct. 4 at 7 p.m. at the Brookline Booksmith.